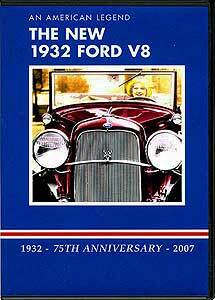 The New 1932 Ford V8 DVD by Lorin Sorensen. The experts said it couldn't be done but Henry Ford would build the auto industry's first low-price V-8 engine. Then he gave the job of designing the car to his talented son Edsel. The result was a masterpiece of speed and beautya car that would become one of the most enduring American automobile legends of all time. With edits from the Ford film Source of the Ford Car, the story includes all the trials and tribulations of creating the car. The difficult work casting the first engine blocks in one piece, tooling up for manufacture, and how producing the new cars nearly broke the company is clearly detailed. The film includes a review of all the passenger models, design features, and interior and chassis details. Highlights of the car's introduction include shows at Ford's Highland Park plant and the Michigan State Fair in Detroit. Bonus footage includes W.C. Fields wrecking a new '32 Ford Phaeton in one of his classic comedies, Indy champ Fred Frame trying out his speedy new Roadster, and veteran race car driver Eddie Pullen tearing up California's Mojave Desert in an enduro run behind the wheel of his speedy new Victoria. running time: 50 minutes, black & white, sound, © 1990, 05 Lorin Sorensen. All rights reserved.